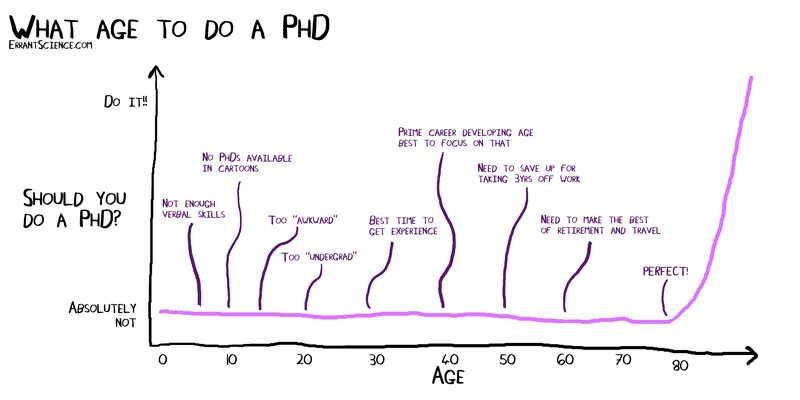 Am I too old to do a PhD? It was a particularly quiet tea break in the department and we were discussing the fact that a place had been offered to a new PhD student. The reason it suddenly became a little bit awkward over our cups of very reasonably priced tea was that the staff member who said that was sat next to your humble author who happens to be a (nearly) 40 year old who started a PhD 4 months ago just looking to change careers. Thank you for reading. We look forward to seeing you in the next installment of Clutter. What? You want more? That is unacceptable. I am an old man, I need a nap! OK. I will struggle on. When I thought about what is the right age to do a PhD, my first thought was “Kids today, they don’t know they are born!”, but my second, more relevant, thought was “What is the point of a PhD?”. At every PhD interview I have been to (n=3) you are asked “So, why do you want to do a PhD?”, and every PhD student I know (n=lots) comes up with an idea on the spot, not really knowing a good answer. But, on reflection, this ties in to the question of age. From the other side of the interview desk, the question becomes “Why are we giving this person the chance to do a PhD?” and that has some deep philosophical implications. A PhD makes you part of something like a scientific family. In some senses, my supervisors are my sciencey mum and dad (but they give me less ice cream than I would like, and I think I might be older than my dad), and in any family some people want the family job to continue down the generations. As a fledgling scientist, should it be expected that I eventually nurture some future scientists, and how many sciencey kids am I going to be able to have if I finally get my PhD at the age of 45? By taking this PhD place instead of a 25 year old have I deprived the world of the academic grandfather of the guy who uses lasers to cure male pattern baldness? On the other hand, I tend to look at my PhD as being a sort of job. In this case, the job is to find out if this sciencey thing can be done and if it can, how well can we do it. Being older than the average student means I have somewhat more work experience than them. And this experience gives me skills that maybe the young child who hypothetically I took the place from did not have. 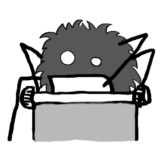 I don’t need to be shown how to complete a lab book, or take minutes for a meeting, or to wipe my own nose; all of which make me vastly superior to that that idiot infant who was hypothetically competing against me for this job. As a result, this particular sciencey thing will be done better than it would be if they had given the job to the snot nosed kid I hypothetically competed against. And who knows, someone might take my awesome science and use it to cure male pattern baldness before I die! I honestly don’t know the answer to the dilemma, and I think that my unintentionally insulting and flattering colleague had a good point. But I also think my supervisors had a better point. I know it was better because it meant that I got to do what I always wanted to do, even I if I never knew why I wanted to do it. In the meantime, I will enjoy spending my time in an office of young people who think that the sound of a dial up modem is hilariously old fashioned, while I still struggle to believe that I live in the future that allows computers to talk over the phone! What happens if you are self financed, starting in your 20’s, then run out of time and money, but keep on maintaining the content, monitoring the relevant areas, other published works but no one else picks up on your breakthrough ideas, just the easy bits? If you don’t do it, you’ll still be old, but without a Ph.D. Besides, like you, I want to understand all that sciencey stuff. I’m almost old enough to start, and my biggest regret is having seen the world progress from radios to quantum computers, I want to see what comes next! Age 68, working on my second PhD as a retirement project. Having a ball! Great article. I’m also 40, I defend my proposal later this semester. Work experience and maturity make the academic part of learning much easier than as an undergraduate. However, balancing the real part of living with a wife and 3 kids is where the real challenge comes in. Clearly you haven’t seen me in the lab! I was 53 when I started my Law PhD and one of the reasons I was offered the studentship was the experience and contacts I had gathered over my working life plus my passion for the research subject – it’s not just about a change if career, it’s on merit. And I’m likely to be working til I’m 70, according to the latest estimates. We need to let go this tendency towards ageism. I was 45 when I started mine. I hit the menopause not long after (great that I’m a prodigy in something). It’s played havoc with my mind, memory, thinking. I’m battling through. It’s just yet another hurdle. If I get through this, I should be the most employable person in the world due to the sheer tenacity that’s got me there.